First, you may be wondering why the Barbecue Master is going to be in the local newspaper. Or not. But, the story makes more sense with a tad of background. 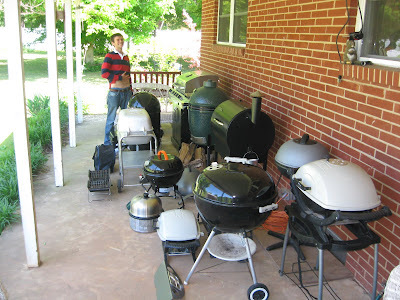 This winter I tested grills and wrote an article on grills for Consumers Digest. Sounds simple enough, but it took about four months. A friend I work with tipped off the Salisbury Post, our local paper. Now, I'm not big on media attention. I prefer to be doing the coverage, but the photographer who was coming out was Jon Lakey. I know him, and he's a good guy. That made it more comfortable. Maybe he will delete all photos where I look goofy and/or fat. Let's hope so. I don't suppose I'd have to have any food grilling for photos of the grills here on my porch, but how strange is that? Grill Girl is not grilling. Just standing next to empty grills. That's rather dull. Plus, the boys have to eat anyway. So, I selected simple grill items. When doing multiple things at once, it is not a good idea to go with either new recipes or the harder ones. But, I wanted good food. One thing we really love are beer boiled brats. 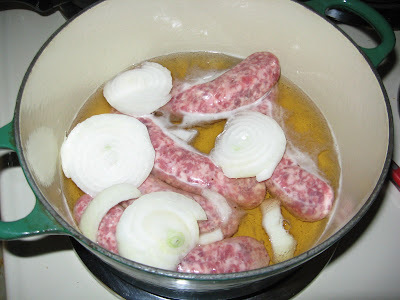 Here, I simply simmered the uncooked type brats in beer and onions. You can add a couple of tablespoons of butter, but I sure forgot to do that. They turned out fine anyway though. There are a lot of ways to do brats, and it depends on the type you get. 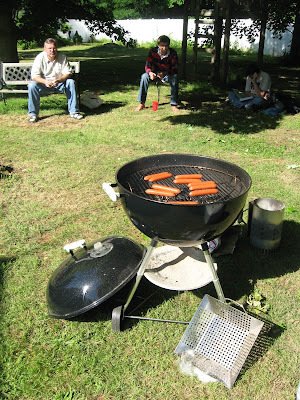 If you are having the urge for some, then check out my brats grill guide. That should cover you on all the basics. I also had some chicken tenders to grill. Those are super simple and take 5 minutes or less per side. My boneless chicken breast grilling guide tells you how to do these but just cook for less time with the fingers or if you split the breasts. There's also a pack of hot dogs. I figured it Jon wanted to see any other grill in action, that would be easy enough. Crank one up, and hot dogs really just need heated. Very simple. I had also picked up Texas Toast and canned biscuits. Texas Toast can be made on virtually any grill. Just don't get the kind with cheese as that sticks and burns. The biscuits work well on the Traeger pellet grill which I know is more unusual so wanted to show Jon. 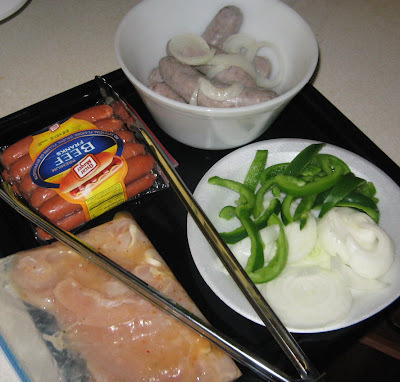 OK. Those are my super duper easy grill foods that are quick and do not require much attention. It would be a darn shame to burn up some food and make the front page of the paper with loads of grills and charred food. That would be worse than looking fat or having a bad hair day in the photos. 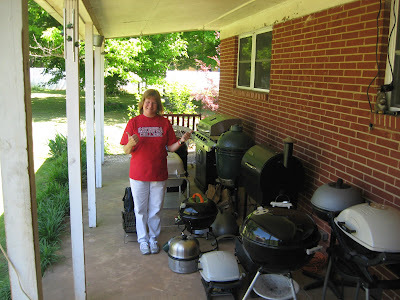 I started yesterday on the porch grills, because even if they were clean, they do not stay that way in North Carolina. We have yellow pollen and red dust. Also, I was lazy and flat didn't wash a couple after grilling. One thing I can tell is that grills that are used don't look brand new even if you do scrub, but they look better than ones not cleaned at all. If you have OCD, you may not want to own grills. They tend to be dirt magnets. But, everything cleaned up pretty good I think. If you do not think so, you can come help out next time. I am also thinking that the family rule should be that those who eat the food off the grill should help clean them from now on. SHHHH. I have not sprung that one yet. The boys probably think they are all self cleaning. Actually, the Char Broil gas is pretty close which I appreciate. The guys all got in at various times before I was putting the food on. The oldest got in from a summer college class in Spanish at Catawba College. As you can see, he is hungry. The younger one is still full days at the high school but will be out for the summer soon. Their Dad teaches, so he also got in before 3 p.m. Those school lunches are skimpy these days, so my crowd comes home hungry. They often snack, and we have a late supper. Or, we have an early supper and they snack later. In any case, we tend to have two meals of some type before dark. On a happy note, I don't make breakfast but do buy quick stuff. Mornings do not do me proud. So, that works out. Jon got all the photos he needed, and he had some grilled food with us which I'd emailed about. That's just Southern. You don't have someone over and let them watch you eat. How rude. Media folks can't take gifts, but sure they can have some food. Same goes with the police. If you have a party, and it gets too loud and the police come, give them some food, say "sorry" and tone it down. Common sense. But, some folks just don't think about it. I'd say take that tip and run with it. Breaking bread together just makes sense. I always have plenty, and I enjoy seeing others enjoy it. We didn't need the hot dogs, but the grill was hot. I put those on while I cleaned up. And, the boys did help out. Yay them. When they get hungry here in a few hours, they have some hot dogs grilled over charcoal on the Weber Grill which are the very best. So, I can put my feet up and relax. That's good, because being in the paper is more work than you might think. It's like, "Who put those spider webs in the corner of the porch? And, why did I run out of catsup and not know it? And, why didn't I think to get plastic forks and knives?" In the end, it's all good. Media people are just people (I've been one and still am). It was a pleasure to have Jon over today, and I look forward to seeing the article and pictures he shot. I'm not sure when the grill article is going to run, but I'll link it when it goes up.